May 31, 2015 September 30, 2015 / Elizabeth T.
My go-to lip color this past month, Etude House’s Cherry Pink Tint is such a fun and flirty color that’s perfect for spring! 🙂 I love how natural this looks on the lips because it dries matte, and the color stays on forever! Unlike some other tints that have a more watery formula, this tint has a more milky texture, so it’s super easy to blend, gliding on smoothly and easily. Whether I wear only one layer or I apply extra layers for a more vibrant color, the thing I enjoy the most about these tints is that I don’t have to worry about it smudging. Described as a “long-lasting moisture winter-cushion that keeps your skin hydrated for a long period by restoring moisture to your skin,” Innisfree’s Ampoule Intense Cushion has been my go-to base makeup this month, particularly since the weather’s been fluctuating a lot, and my skin is super duper. With a formula that has slightly more coverage than the average BB or CC cream but not as heavy as a foundation, this cushion offers ample UV protection (SPF34) and a brightening, natural coverage. 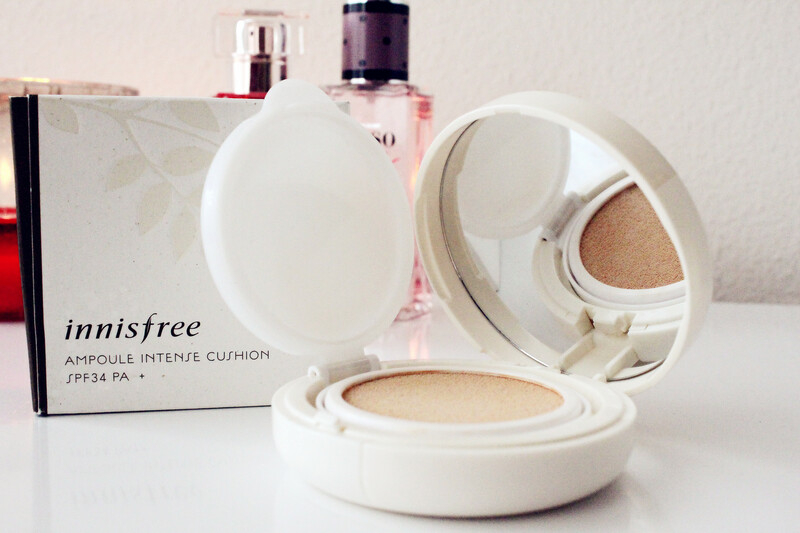 With added nurtrients such as Jeju mineral powder and Jeju green tea, it’s no wonder this particular Innisfree cushion has been so popular in not only Korea, but also abroad. I personally like it a lot, and I feel that it really helps my skin stay moisturized throughout the day, giving off a really nice dewy effect. 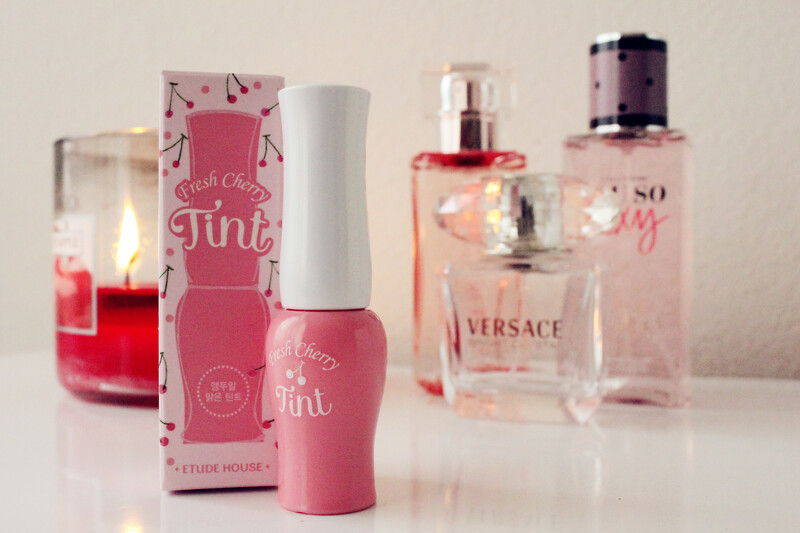 The color also matches my skin really well, so a big plus. Also, the puff that comes with the cushion is almost magical! 🙂 I’ve used a variety of high-end to mid-end foundation brushes and sponges, but nothing (other than my fingers of course) gives off such a flawless and powerless application. The only slight downside is that the puff is kind of difficult to clean, so you’ll most likely need to buy replacements. But I will definitely be repurchasing this! I’ve always leaned more towards gel liners because I feel that application is really easy to control, especially in comparison to liquid liners, but for some reason, something compelled me to buy this Innisfree liquid liner. And boy am I glad that I did! 🙂 It’s absolutely amazing! It’s so waterproof, and I love how the brush can allow you to draw a thick or thin line. The color is really solidly black, and even after wear for more than 6 hours, it didn’t move or smug at all. I also like how convenient it is because you can literally just stick it in your purse and bring it on the go with you. The Sinful Colors nail polish all have such a nice, thick formula, and I really like how the colors last on the nails for a pretty long time. Initially, I wanted to purchase a brighter, fresher color for the spring and summer, but something was just pulling me towards this shimmery, darker shade, colors I typically wear in the fall or winter. After trying it though, I fell in love with the color! It’s a lot brighter than it looks, giving off a more rose-gold kind of feel. 🙂 And the best part of shimmery nail polishes is that it takes longer to chip (so yay for the lazy girl in me who wants to have a mani that lasts as long as possible)! 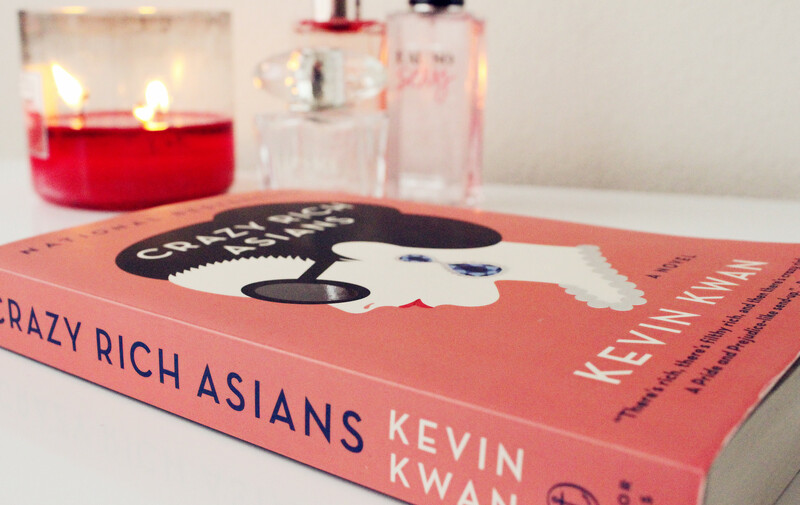 My favorite book of this month is Crazy Rich Asians by Kevin Kwan. I first heard of the book through a YouTube video on LeendaDProductions channel (she did a hilarious parody of it), and that’s what piqued my interest in the novel. Set mostly in the affluent city of Singapore, the book explored the protagonist’s boyfriend’s super crazy rich family. 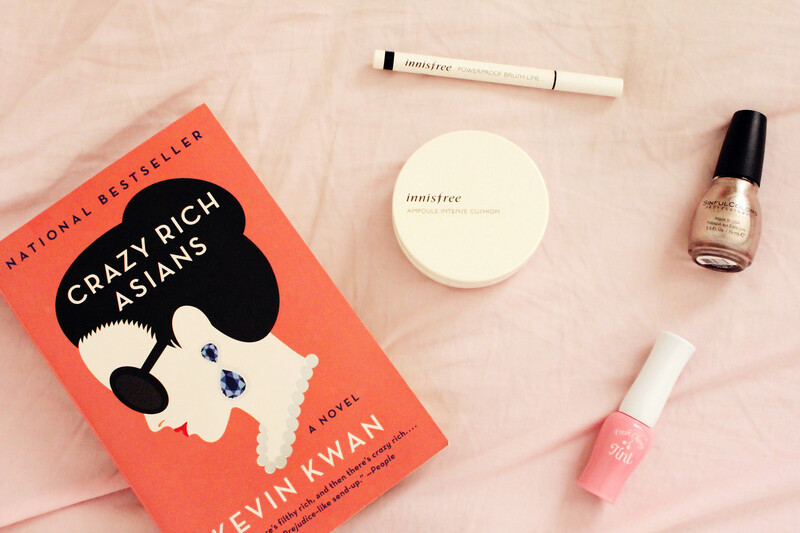 Having been a fan of both the Gossip Girl books and television series, I have to say, Kevin Kwan’s crazy rich Asians put my favorite Upper East Siders to shame. My God, they have so much money! It seems almost impossible! And finally, the show that I’ve been guiltily binge watching is The CW’s Arrow starring the charming Stephen Amell who plays Oliver Queen, the DC Comics character otherwise known as Green Arrow. Though the first few episodes focus on Oliver’s role as the vigilante who returns home to fight crime and corruption based off of a notebook that his late father gives Oliver in his last moments, the underlying story is much more interesting, and with each passing episode, more is revealed. What I really enjoy about this show is that it deeply explores Oliver’s humanity. Because he was left stranded to fend for himself for five years on a stranded island, he’s no longer the boy he was when he first arrived at the island, and instead, has become someone who’s stronger, but also a lot more cold and closed off. I love how the show tries to show this aspect of the show. And it’s definitely a bonus that Stephen Amell is so charming and masculine too! So that sums up all of my May favorites! Let me know what’re all of your favorites for this month as well! I’ll be back again soon! ← Mason Jars + Candles = Spring! 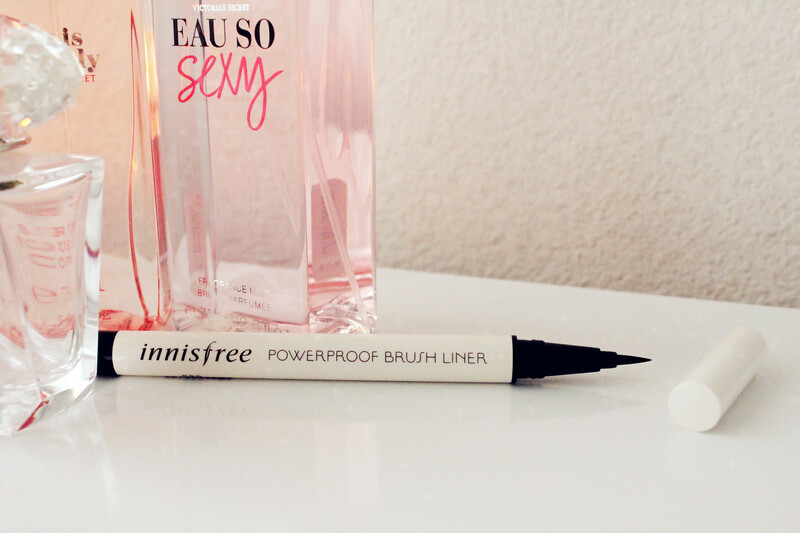 That waterproof eyeliner looks nice. 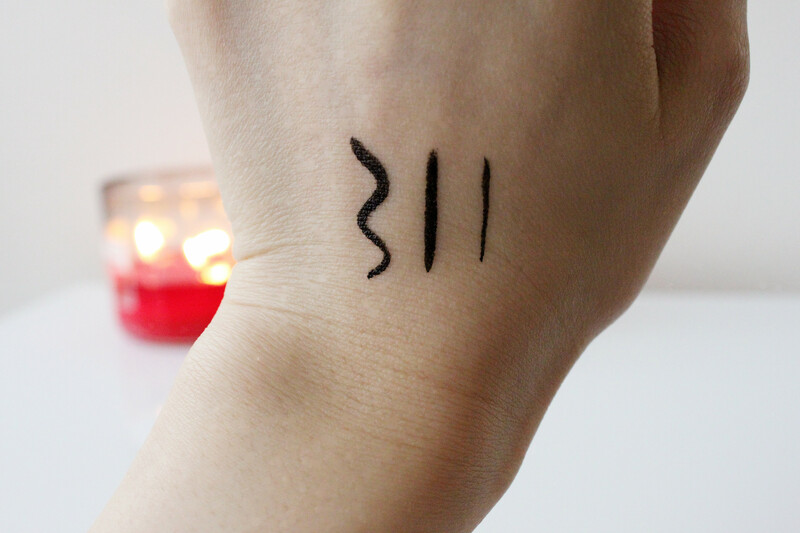 Yes, the eyeliner is actually really good! I was surprised by it! 🙂 Definitely a great purchase! And thank you for checking out my post! Hope it was an enjoyable read for you! If you want, we can follow each other. Let me know and I’ll do the same!